Many buyers are saying that the Under Armour Curry 4 is one of the best looking shoes out on the market today. Under Armour’s HOVR Havoc takes after the Curry 4’s silhouette. Nearly all the testers are satisfied with the minimalist cushion setup. The EVA foam is low to the ground and has a bit of bounce to it. The UA Curry 4 is a solid on-court performer according to several wearers. One user asserts that these are the best high-top basketball shoes available right now. Majority of the testers are amazed by the shoe’s stop-on-a-dime traction. It bites the floor very well and allows quick changes in direction. These Stephen Curry basketball shoes fit true to size, most comment. The knitted material delivers a perfect one-to-one fit. Some are claiming that the Curry 4 is among the best fitting high-top basketball shoes they have ever worn. They say that these sneakers are just anatomically correct and the materials mold to the shape of the foot. Several players are happy with the overall lockdown and containment. They did not experience any internal slippage. The outsole is a dust magnet, some observe. Wiping is necessary when playing on dusty courts. Just like the Curry 6, the Curry 4 is not made for outdoor courts, more than a handful comment. They claim that the materials are thin and not durable. For a signature sneaker, the synthetic material feels cheap and plasticky according to some testers. The Under Armour Curry 4 feels stiff out of the box, several buyers remark. It’s very uncomfortable the first few wears. Some wearers warn about a painful break-in period. They experience pinching in the forefoot and ankle areas that results in horrible blisters. 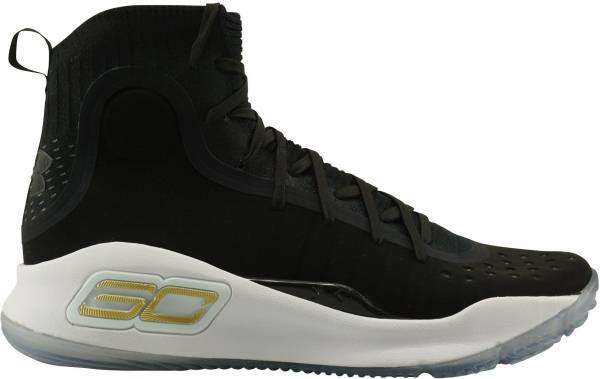 Stephen Curry was involved throughout the entire design process of these Under Armour shoes, so it comes as no surprise that the Under Armour Curry 4 favors light and fast guards. Explosive players and big men who require a ton of cushioning and support may want to try something else. If you are a casual wearer who is just looking for a stylish sneaker that is comfortable to walk in, the Curry 4 also fits the bill. Not only do I love the Curry 4, but now I’m really excited for the Curry 5. For a guard, this is an amazing shoe. The Under Armour Curry 4 makes more from less, and the league may be in trouble. The fourth installation of Steph’s signature shoe is designed to deliver more control, comfort, and traction. Whether he’s breaking down the defense to get to the rim or he’s draining threes from way beyond the arc, the Under Armour Curry 4 helps him do it all. With an entirely new design, the UA Curry 4 has evolved into shoes that keep up with Steph’s unique game. It features a knitted sleeve for comfort, microfiber quarter panel for support, speed plate for containment, and cross-centric traction for enhanced court control and grip. Cushion. The Curry 4 features a new one-piece Speed Plate that focuses on lateral containment and midfoot rigidity. “When you look in the medial arch area, we shaved out a ton of weight there and then exposed that plate,” UA lead designer Kort Neumann explains in an interview. “We’re trying to get it to do two things at once in the forefoot. We’ve gotta still let it flex but still contain your foot when you’re cutting. We wanted to expose as much of that as possible.” This full-length plate is built to withstand explosive movements. After addressing midfoot stability, Under Armour also created a new proprietary EVA foam compound that is engineered to deliver more responsiveness underfoot. Traction. The UA Curry 4 features a new cross-centric outsole pattern that is inspired by Albert Einstein’s theory of gravitational waves. The pattern is designed to optimize heel-to-forefoot traction for amazing on-court control and grip. Length and Width. Because of its tricky fit, buyers are advised to try the shoes in-store first. However, testers highly recommend going with your actual size because the materials will eventually mold to your foot after the initial break-in period. Lockdown. Keeping the foot securely in place is a knit inner sleeve that creates a locked-in fit around the ankle and forefoot. Hits of synthetic are bonded with the knit material for added support. With the Curry 4, Steph wanted a sneaker that delivers a seamless transition from his foot to the shoe. He wanted a material that will comfortably hug his foot. With that, a knit internal sleeve was created to deliver the perfect structural fit. A microfiber synthetic quarter panel provides lightweight reinforcement while the Bemis textile tape bonds the synthetic quarter and knit sleeve without adding any stitching. With functionality in mind, the Under Armour Curry 4 has a highly stretchable high-top collar that allows Steph to place his ankle brace securely. “Ultimately, the 4 is an expression of our study in minimalism,” says Neumann. Its polished and sleek silhouette features subtle design elements linked to Steph’s personal life. His family’s names and birth years are found along the outsole while his initials are seen on the inner collar strip. Rounding it out is the strong SC/30 branding located on the lateral side of the shoe. Aside from the basic colorways, these high-top Under Armour shoes also got special storied renditions. Some of them are discussed in the subsections below. Stephen Curry is the captain of one of the teams that play during the 2018 All-Star Break. The Curry 4 undergoes a sleek makeover for this All-Star Game appearance in Los Angeles. The AS version boasts an all-white upper and an icy blue iridescent outsole that pay tribute to LA as the City of Angels. The neat yet scene-stealing white upper of the Curry 4 All Star represents the duality of Stephen Curry’s on-court character. His shooting skills make him a formidable scorer; his understanding of the game makes him fit to be captain. The UA Curry 4 for the 2018 All-Star Game is available on Feb 16. At the conclusion of the 2017 NBA Finals, Stephen Curry and the rest of the Golden State Warriors succeeded in getting the championship title back from LeBron James and the Cleveland Cavaliers. Shortly after their victory, fans are presented with a unique offering from Under Armour. Dubbed the Championship Pack, the company made available a special package that contains two pairs of Stance socks, a golf divot tool that also serves as a cigar holder, the two renditions of the Curry 4 that Steph wore during the Finals, and a letter signed by Stephen Curry himself. The two Finals colorways of the Curry 4 are sometimes referred to as the ‘More Rings’ versions, in direct reference of course to the rings that the eventual champions will get from the NBA. These two builds of the Curry 4 also were released individually. White/Gold. The white pair from the Championship pack made a solo appearance in late November 2017. Although the two look pretty similar, there are actually subtle differences. For one, the individually released build doesn’t have an official name. The gold medial tab that used to be have ‘WE BACK’ on it now only has Curry’s SC30 logo and the Roman numeral IV. Black/Gold. More or less a month after the solo appearance of the White/Gold colorway, the other half of the Champion Pack also made its solo debut. Now called the ‘More Dimes’ colorway, this pair is a bit different from the original. Instead of synthetic leather, the upper is made of synthetic nubuck. To celebrate Valentine’s Day, Under Armour combined the consuming passion of red with the relaxing immaculateness of white to create the ‘Flushed Pink’ version of the Under Armour Curry 4. According to UA, this color represents Stephen Curry’s sure and loyal love for his wife Ayesha and the game basketball. This build was released on February 18, 2018. The gray ‘More Buckets’ version of the fourth Curry shoes honors Steph as one of the league’s most prolific scorers today. According to the designers at UA, the lighter shade of gray in the lower part of the shoe represents Steph’s humble beginnings. The darker shade right above it symbolizes the player’s current and future achievements. This build was made public toward the end of 2017. To create the ‘More Dubs’ colorway, the Under Armour Curry 4 is made largely white with a gold SC30 on a gradient blue midsole. The colors used are an obvious nod to the Golden State Warriors. According to Under Armour, this is their way of expressing their gratitude to the fans who watch every game and make the team such a huge success in today’s NBA. This build was released in mid December 2017. Dressed in the Dub Nation’s royal blue, the ‘More Fun’ colorway celebrates Steph’s fun-loving and playful side. "When I've always played basketball, I was always the goofy kid, running around, having fun, doing what I loved to do,” Stephen Curry himself said. “I don't think I've ever lost that as I've gone through the ranks -- high school, college to now. I just enjoy it. I think from my personal belief system is that I've been in this situation, this stage, for a reason: to shine light on things that I believe in. That's the most constant thing for me." The ‘More Fun’ build of the Curry 4 was released in mid November 2017. The Under Armour Curry 4 More Magic was supposed to be a China exclusive. In fact, its multicolored upper draws inspiration from the distinctive central Shanghai waterfront called Waitan or the Bund. However, due to popular demand, the shoe made it to US soil in October 2017. The ‘More Range’ build of the fourth Curry sneakers honors his unique ability to score from a distance. Its nearly all-black upper sits on a white outsole. This pair of high-tops have luminous accents to add a bit of seriousness to their overall look. The model was released on Christmas Eve 2017.